Candice Hill is a percussionist and steel pan (steel drum) performer and instructor. She performs live and teaches drum lessons, steel pan lessons, percussion lessons and more in the Kansas City, MO area. Candice also holds the position of adjunct faculty, teaching college level percussion, as well as contract services for local high school and middle school percussion. Services offered include: live performances, private instruction, clinics, speeches, drumline instruction, arranging and composing for steel band, drumline, solo and ensemble groups. Candice Hill was born in St. Louis, MO and raised in Columbia, MO. She graduated from Columbia Hickman High School, and went on to Missouri State University, where she received her Bachelors degree in Music Performance on Percussion. While at MSU, she started playing steel pan for fun, then started playing more seriously with a group called MR8. After seeing Liam Teague perform live, she decided she wanted to go to Northern Illinois University to get her Masters degree in Music Performance on Steel Pan. 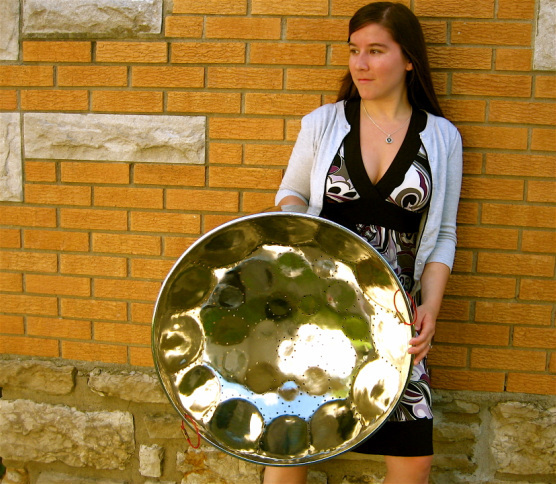 After studying with Liam Teague and Cliff Alexis, and receiving her Masters degree, she moved back to Missouri to spread the word and help promote the legitimacy of the steel pan as a concert instrument. Candice has performed in Trinidad with Skiffle Bunch in 2006 Panorama, and has performed as a guest artist in Missouri and Illinois. She performs regularly in the Kansas City area and teaches private lessons on drumset, steel pan and percussion. She also teaches private lessons in all areas of percussion and currently teaches high school drumline, high school percussion, and middle school percussion. Candice has performed in marching bands, jazz bands, concert bands, orchestras, municipal bands, percussion ensembles, steel bands, winter drumline and other ensembles throughout her high school, college, graduate school and professional career.